And now, without further ado, welcome to Big Feast! Take it away, Arielle. As a teenage girl, I could usually be found in one of two places. When I wasn't sprawled out at my best friend Molly's eating Nutty Bars and watching Ricki Lake, I was poring over cookbooks and studying all things Martha Stewart (there's not a lot to do in rural Buda, Texas). Even though in those days I dreamed of being a high-powered bureaucrat working in the Office of Management and Budget (I don't know why I was so specific about that), I also aspired to be the sort of über-hostess who greets her guests at the door with a shiny platter of warm gougères. Now I'm 28. I worked in politics fresh out of college and absolutely hated it, but my love of entertaining has remained. I never gave up my Martha addiction, and have used every birthday and gift-giving holiday to stockpile white platters and pieces of cooking equipment. Thus, I have a reputation amongst my friends as the person you go to for help with party planning. So when Molly -- still a best friend -- asked for my help planning a surprise 30th birthday party for her boyfriend, I was thrilled to have a big event to daydream about. Dustin, a biotechnologist, loves all things science. He routinely posts links to various bits of science-geekery on Facebook: pictures of Earth from space, nanotechnology for waterproofing sneakers, etc. 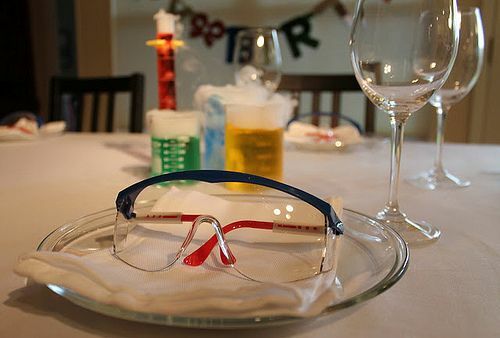 What if we made a Science!-themed party? 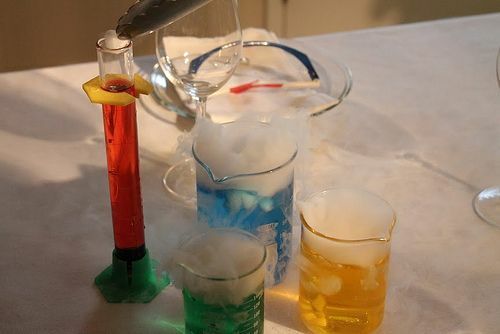 Molecular gastronomy techniques, food in petri dishes, drinks in test tubes -- the works?! Yes! We were off and running. Let the brainstorming begin! I remembered that I'd seen an episode of Made in Spain that featured some very science-y dishes from José Andrés' DC restaurant, Minibar. One in particular stuck with me -- a caprese "skewer" where the skewer was actually a pipette filled with a mozzarella cream that you squeezed into your mouth as you nibbled at the tomato and basil. Reading about temples of molecular gastronomy like Alinea and El Bulli, I became enthralled with the idea of a meal that could so surprise and delight you. Yes, I love simple food, deliciously prepared with the finest ingredients. But there's something magical about biting into something you think is an olive, only to have it be a spherical packet of intensely-flavored olive juice. I haven't had the chance to eat at any of these restaurants, but thanks to the internet, the chemicals and recipes needed to create these experiences at home are just a few clicks away! I was thrilled at the prospect of trying my hand at molecular gastronomy, and even more excited to do it with my closest friends! To begin planning the menu, I thought back to the dishes I'd read about or seen on television. 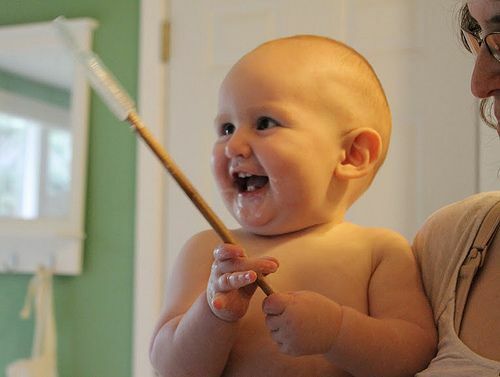 We would definitely have a course where a pipette was used as a skewer. And fortuitously, just before we started planning the party, an episode of Top Chef aired with a quickfire challenge involving Nathan Myhrvold's mammoth Modernist Cuisine book. I remembered three dishes in particular that I thought I could emulate: a dish with powdered olive oil, another with a dill "caviar" (involving a technique called spherification), and a Miracle Berry tasting plate (though it sounds like something you'd take at a rave, Miracle Berry is a totally legit pill that makes everything taste sweet for an hour or two). I had ideas for four courses already! Through random googling, I came across an idea for serving jello shots in petri dishes. But this was a gougères-on-shiny-platters-kind of party, so I would fill my petri dishes with a savory gelée instead, inspired by an item on the Uchi menu. So I had five courses all sorted out. Petri dishes and pipettes! This was really starting to sound science-y. Little by little, the menu began to take shape. A Food52 article on Super Bowl fare reminded me of Oui, Chef's ridiculously delicious herbed beef skewers -- sublime party fare that, along with the horseradish cream, lent themselves perfectly to the pipette course. Along the way, I discovered a very helpful site that yielded ideas for a cheese course that would be a natural place to feature powdered olive oil and spherified honey, in addition to grapes that had been carbonated with dry ice. Amanda's mention of popped sorghum on the FOOD52 "52" got me thinking about a plate of miniaturized fair foods. 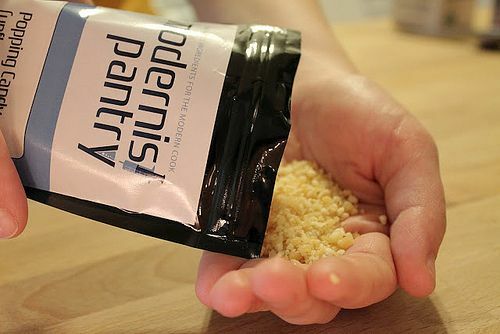 And when I was ready to purchase the chemicals for the faux caviar and the powdered olive oil, I made a last-minute impulse purchase of some unflavored pop rocks to incorporate into another savory course. Top it off with KelseyTheNaptimeChef's chocolate cake decorated to look like the periodic table, and we had ourselves the start of a seven-course feast! After much, much more tinkering, I finally had a working menu. To help plan, I typed up the menu with links to recipes I'd be using that I hadn't made before. 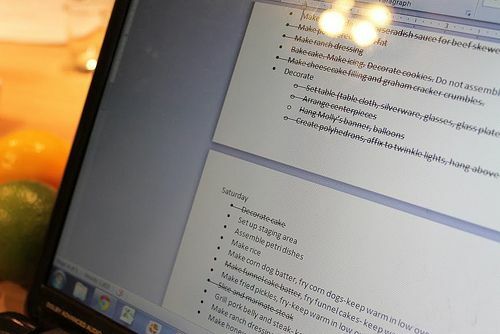 I wrote up a shopping list for items I would need, with sections for the farmers' market and grocery store, including when the items would need to be purchased (for example, the meat I used was purchased at the farmers' market the week before the party because it is sold frozen, so I needed lead time to defrost it). I sketched (and my sister Helenthenanny resketched -- she's a much tidier artist than me!) pictures of what the courses would look like, so I could get a sense of what equipment I would need to plate each dish, and so I could make sure I had enough serving pieces to make every course look the way I envisioned it. Lastly, I made up a to-do list for Thursday, Friday, and Saturday (the day of the party), with the bullets listing everything that needed to be done in the order I would need to do it. I know it sounds like a lot, but all this planning really helped me keep cool and stay on task during the hours of prep work. 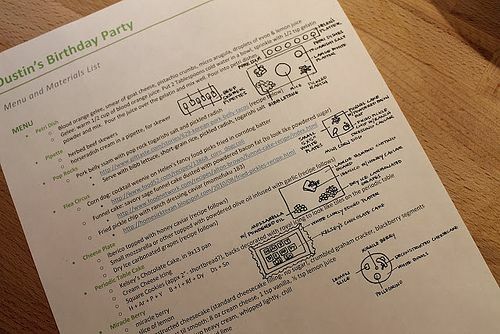 Planning the party was such fun -- I can't wait to show you how it turned out! 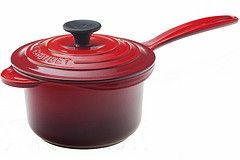 Le Creuset has generously offered to reward our Big Feasters for all their hard work, and as our first Big Feast, Arielle will win, in the color of her choice (flame, cherry, fennel, or cassis): a 4 1/2-quart round French oven, a 10 1/4-inch iron handle skillet, and a 2 3/4-quart precision pour pan. 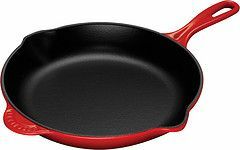 Pitch us your Big Feast at [email protected] for a chance to win $500 in Le Creuset booty. 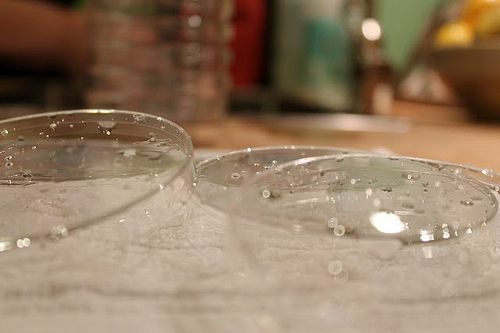 Inspired to play with molecular gastronomy at home? Check out a very cool Molecular Gastronomy kit from Molecule-R, available in the shop now! I have always loved food. My favorite books as a kid always featured food (eg. The Berenstain Bears Get the Gimmies- so much candy!) and I loved cooking shows like Yan Can Cook and The Frugal Gourmet. I started cooking the Thanksgiving dinner for my family when I was 13 years old. I have food52 to thank for inspiring me to come up with my own recipes, as well as for introducing me to a community of fantastic cooks and their amazing recipes. I try my best to cook locally and seasonally, and I tend to prefer straightforward, simple recipes where the ingredients get to shine. I live in wonderful Austin, Texas with my husband, Andy (a video game programmer) and my son, Henry (an 8-month-old who loves to eat). Inspired......to the hilt. Very well done! Congrats arielleclementine! What a fabulous, inspiring, first big feast!! I can't wait for your next post. way to go sister!! such a fun first post and i can't wait to read the rest! it was one of the most amazing, most delicious dinners i've ever had!! Excellent job on the photos! oh wow!! you guys are the nicest! thank you so much for all of your kind comments! and huge thanks to helenthenanny for photographing everything and to Miranda for being such a wonderful editor! i hope you like the next posts as much as this one! i'm going to have a real hard time reining in my use of exclamation points this week! What an impressive first "course" of Big Feast features! Can't wait for more! Arielle and Helen never cease to amaze me. This is a really fun post! I must say she did not get her organizational skills from me! This is so fun! Congratulations arielleclementine on being the first big feaster. I need to re-read your post because you have so much going on. Looking forward to the next posts, cheers! What a great party idea! I must confess that the thought of molecular-gastronomized food makes me cringe (I'm an old fashioned, grandma's-cooking kind of guy), but your menu sounds so intriguing and so much fun to make. I can't wait for the next installment! Cannot wait! I've been interested in trying out molecular gastronomy techniques...it iwll be wonderful to read about your experiences first! 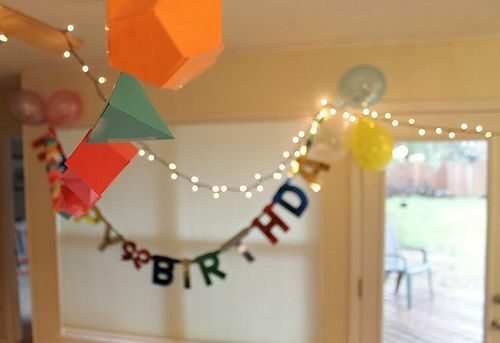 This looks like such an amazing party - I can't wait to hear how it all turns out! AC, great idea for a feast and I can't wait to see everything. You rock! Super cool! I can't wait to see how everything turns out. Congrats! wow, this is amazing. Arielle, you are cooking geek extraordinaire. Food52, how will you top this? No kidding, right? She's set a high bar! What fun! I'm looking forward to the future installments. Wow, I have been called "organized" by many, but I bow down before you, Organizational Goddess. The party looks like such fun, and also an impressive selection of cooking challenges. Can't wait to read the rest of the series.